Being fifty-something, I love to discover new and affordable experiences within a walking radius of home. It gives me faith that if I’m ever asked to hand back my driver license (and that could happen, given my driving skill level or if anyone with any real credibility spies my feeble attempts at parallel parking) I’ll still be able to amuse myself within close proximity of the Mothership. This past weekend, we were introduced to a little gem that dovetails perfectly into the above category … the Woodbin Theatre. This wee little local theatre seats roughly 70 patrons and is the spiritual home of budding thespians and Geelong Repertory. 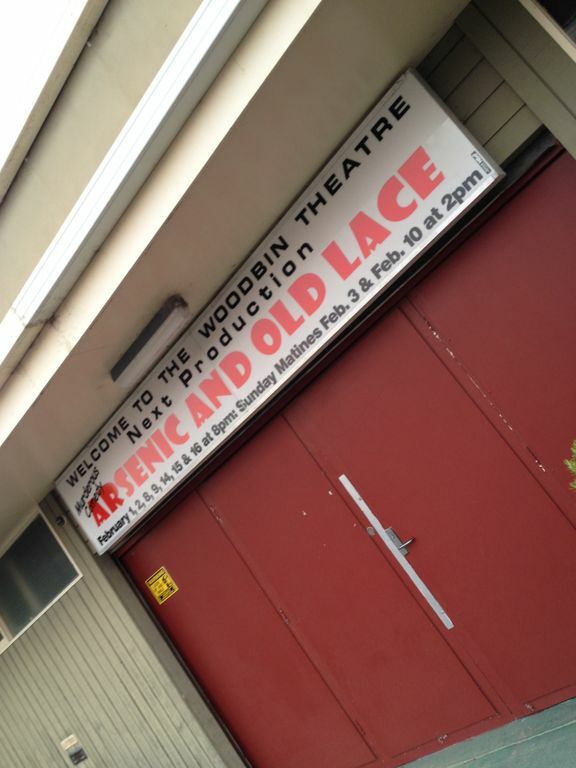 Our neighbour had kindly organised tickets for us to see the Geelong Repertory’s production of Arsenic and Old Lace at the Woodbin Theatre, a teensie weensie facility hidden away in a mostly residential side street in the heart of Geelong West; the very same territory we went planking in not so long back. At $25 a ticket and with the theatre literally five minutes walk from the Mothership, this was an easy sell. 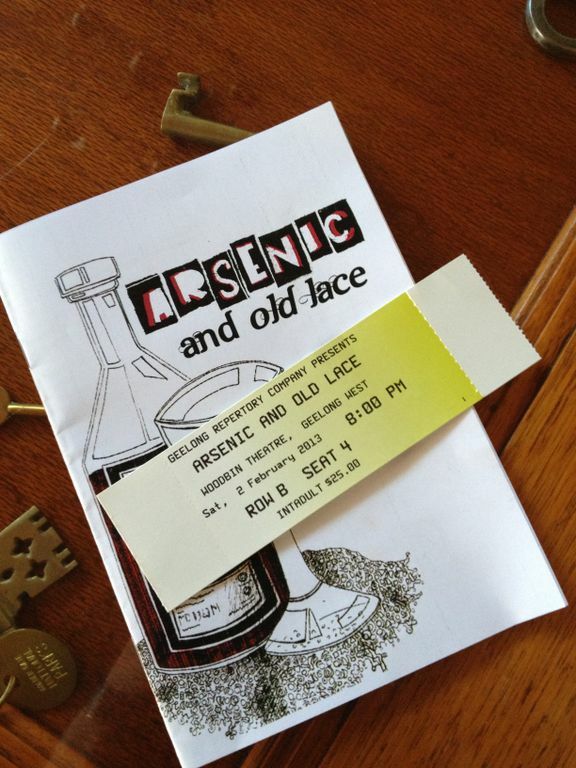 And who doesn’t love the rollicking black comedy style of Arsenic and Old Lace (I had only previously seen snippets of the Cary Grant movie version)? We arrived at the theatre to be greeted by friendly, casually dressed staff and complimentary sherries. The diminutive bar was open for business and in the pint-sized foyer it was easy to spot acquaintances and friends (there were a few in the crowd; for a big city, Geelong is a small world). The bells rang to summon us into the theatre and Mr P was happy to learn that he was welcome to carry his beer into the auditorium (which could be an overstatement) provided he poured it from the glass stubby into a plastic mug (supplied). Done and done. What an intimate setting … we were in the second row and so close to the action that we might as well have been sitting amongst the actors themselves. I stole a quick squiz of the program before the lights went down and discovered that the director had been amongst the foyer greeting party. He’d even sold us raffle tickets to win a bottle of elderberry wine (laughable if you know the plot of Arsenic and Old Lace). I also noted that my old English teacher was amongst the cast, and that my old Geography teacher had had a hand in creating the set (which was quite spectacular and intelligently designed for maximum effect and function). There was a quick intro and the curtain went up … well not really, there was no stage curtain, more a metaphoric rising of the drapery. Without delay we were transported to another time and place by a cast of brilliant actors, perfectly rehearsed for both their lines and the physicality that is so much a part of this work. We laughed, and laughed … and then we laughed some more. We laughed through a brief intermission (which was long enough for everyone to refresh themselves via the bar) and then filed back in for more giggles. To say we were impressed is an understatement. We were gobsmacked by the professionalism of the cast and their crew (and the mix of young and old) … and by the character and community buzzing about the theatre. More fun than you can poke a walking stick at. And superb value at $25 a ticket. Yes, I’ll say it again: $25 a ticket! 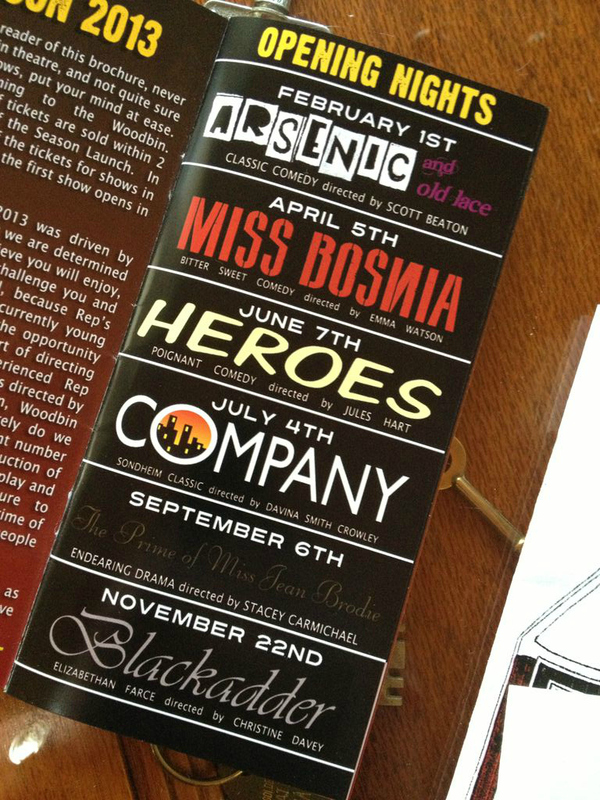 We’re checking out the 2013 season and there are some doozies coming up including Miss Bosnia, The Prime of Miss Jean Brodie and Blackadder. The tiny Woodbin Theatre punches well above its weight and is well worth a visit … for the free sherry, if nothing else. Thanks, Rae. It sure is more relaxing without the parking and drink-counting hassles of taking the car. Now we’re wondering what else of this ilk might be lurking at our doorstep! Fun finding out. 🙂 S.